"I paint what interests me, what excites me, and hope that the paintings convey that excitement and strike a responsive note in the viewer. Since I was a child I have loved painting portraits, figures, and animals, trying to capture the personality and spirit of the subject. I find land and waterscapes more of a challenge, but am inspired often by the light, the composition, or the mood of a place, and I find it very gratifying when a painting is successful and conveys the spark that inspired me to paint it." 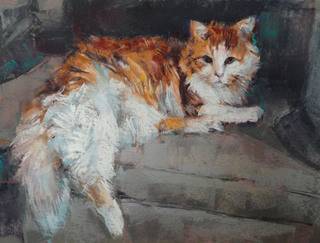 Joyce is a Signature Member of the Maryland Pastel Society and the Pastel Society of America. "Finding your Style in Pastel", by Jean Hirons, Author House, 2012, available from the publisher, or at Amazon.com and Barnes & Noble. "100 Artists of the Mid-Atlantic", by Ashley Rooney, Schiffer Publishing, 2011, available at Amazon.com and Barnes & Noble. "Best of Artists Collectors Edition" (landscape genre) May, 2011.